Professor William “Bill” Montero Sr. Professor Bill Montero was born in the Territory of Hawaii in 1916. He became interested in judo in the early 1930’s and studied at the Shoto Mission in Waipahu and at the Budokai Temple in Palama. Bill became an aggressive and successful judo competitor. 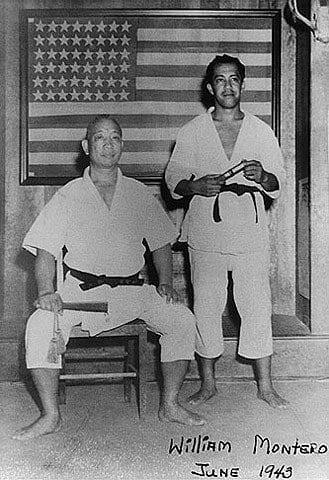 In 1935 he approached Professor Henry Okazaki to inquire about jujitsu as he had heard that he had opened the doors of learning to all races. 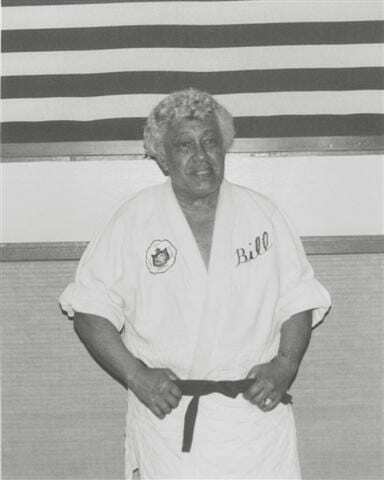 Bill became the first student of John Cahill and helped to start the Hui Mikiki dojo. Bill Montero and John Cahill, and their families, became close friends that continued long after they all had moved to the mainland. Bill was promoted by Professor Okazaki to Rank Three (sandan) on August 21, 1943. He received his Nikko Restoration Massage diploma on November 15, 1943 and a Rank One (shodan) certificate from the International Kendo Institute of Hawaii on May 5, 1950. These certificates were signed by Professor Okazaki. Being an officer in the Hawaiian Territorial Guard, Bill often accompanied and assisted Professor Okazaki with the hand-to-hand combat and knife classes he taught to American troops during WWII. In 1948 Bill and his family moved to California and settled in San Jose. In 1949 he opened the Pacific Judo Academy, a successful dojo that taught jujitsu and judo for over 30 years. Professor Montero taught competitive judo on the national level and produced numerous local, state and national judo champions. In 1958 Professor Montero was commissioned by Santa Clara County (California) to work in their rehabilitation program helping children with walking difficulties. With Nikko Restorative Massage and medical gymnastics, he was able to help many youngsters – some of which became students at the Pacific Judo Academy. Professor Montero, along with John Cahill, Sonny Chang and Markham Spencer, were part of a handful of students that were taught the arts of bokendo by Professor Okazaki in the 1930’s. In the 1960’s Professor Montero revived the arts of bokendo that had been taught to him by Professor Okazaki and included them into his teaching curriculum at the Pacific Judo Academy. During the 1960’s and 1970’s, Professor Montero taught bokendo to the crowd control (riot) units of many police departments in Santa Clara County. Professor Montero retired from the Lockheed Missiles & Space Division in 1981 and moved to Colorado Springs, CO. He continued to hold seminars and clinics for his senior black belts in the arts of Danzan Ryu Jujitsu and Nikko Restorative Massage until to the time of his death in 1992. Additional Martial Arts Ranks Obtained by Professor William Montero Sr.
Rank Four (yodan) May 5, 1951 – American Jujitsu Institute, Signed by Professor Hachiro Okazaki as an advisor. Rank Four (yodan) July 7, 1964 – Kodenkan Judo Institute of Japan. Long time A.J.J.F. members Bob Krull and Bob McKean. Donald Montero, Brian Fitzgerald, Greg Braze, Angelo Caruana, Jim Giambroni, Phil Lanoie, Jo Abbie Sweet and Jim Werner.